If you happen to be one of the Android gaming faithful out there that enjoys doing battle against the undead, as expected the makers of the popular Shadowgun have now made their latest mobile game available to the Android platform in the form of the Dead Trigger app so you can get your zombie killing action on. Dead Trigger for Android features advanced lighting and post-process effects, along with full 3D environments and characters, high quality HD audio and lively soundtrack, intuitive controls, and character animations recorded using high end motion capture. 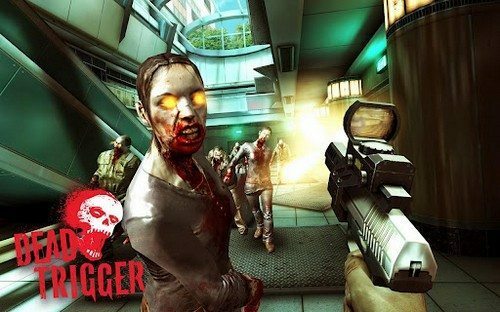 With Dead Trigger for Android the gamer gets to smash hordes of killer zombies, save survivors and vital supplies, explore the city whilst protecting the Safe Haven in this fast paced first person shooter game that allows you to black zombies in differing ways, chop limbs off, blow their heads off, or kill them with creativity. With the Dead Trigger app you can arm yourself with realistic weapons, utilise power gadgets such as a laser amputator, grenades, radar, mines, baits, blade chopper, and many more. Receive free updates with weapons, new missions, characters and gadgets thanks to a new online service from MADFINGER Games. There is also a ragdoll effect, and water simulation but these are only for Tegra 3 devices. Dead Trigger for iOS has been available for a few days, and now Android gets their own Dead Trigger version, and before you dash of to Google Play where you can purchase the game for $0.99, head on down and hit the play button on the iOS/Android Dead Trigger official trailer below…enjoy.